I am a HUGE pasta lover. I think that if I allowed myself to do it, I would eat pasta every day and not get tired of it. You can do so much with it that it never feels like the same thing. Its also such an easy food to work with. Today I was craving it and so was my boyfriend. So I made my lunch for and stored the left overs for him to take to work tomorrow. Very easy and quick recipe. Boil the pasta according to the box directions. While that’s cooking mince 4 cloves of garlic put in a bowl to the side. Take out a can of tuna. In a separate bowl, break the tuna up. Not too much, you don’t want it to look like tuna shavings, but then again you want it broken up enough that its dispersed throughout the dish. Once that’s done, zest an entire lemon and add the zest to the tuna. Take out a pan, pour in about 3-4 tablespoons of olive oil. Once the olive oil is hot enough, add the minced garlic. To the garlic, add about 1/4 tablespoon of red pepper flakes. I added more because my boyfriend is a spice fiend. Allow the garlic to cook for about 3 minutes and then add tuna with the lemon zest. Stir it all up, make sure the garlic is very well incorporated to the tuna. By this time the linguine should be cooked. Take it off the heat and drain it BUUUUT save some of the water, about a half a cup of it. 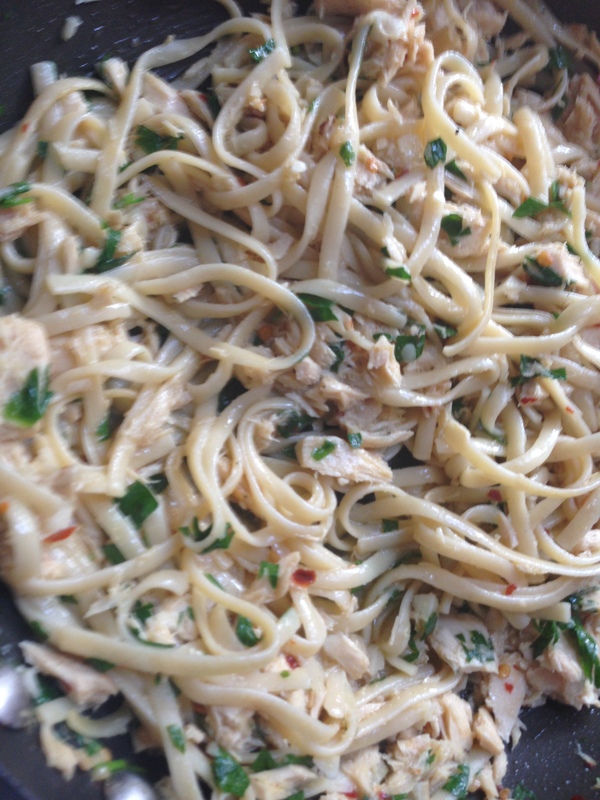 Add the linguine to the pan where the tuna, garlic and lemon zest are cooking. Mix it up and add the water you saved. Add just enough to barely cover the food. Give it a mix and then squeeze half the lemon into it. Add salt and pepper to taste and let it cook on low heat for about 5 minutes so that the sauce thickens a bit. If you want to add more red pepper flakes, then by all means, throw it in there. Turn off the heat after 5 minutes and let sit for about another 5 and then add some chopped parsley. You can add some Parmesan cheese if you like, I didn’t though. Absolutely amazing taste. I wish I had made more so I could eat more of it, but I had to save some for the boyfriend.